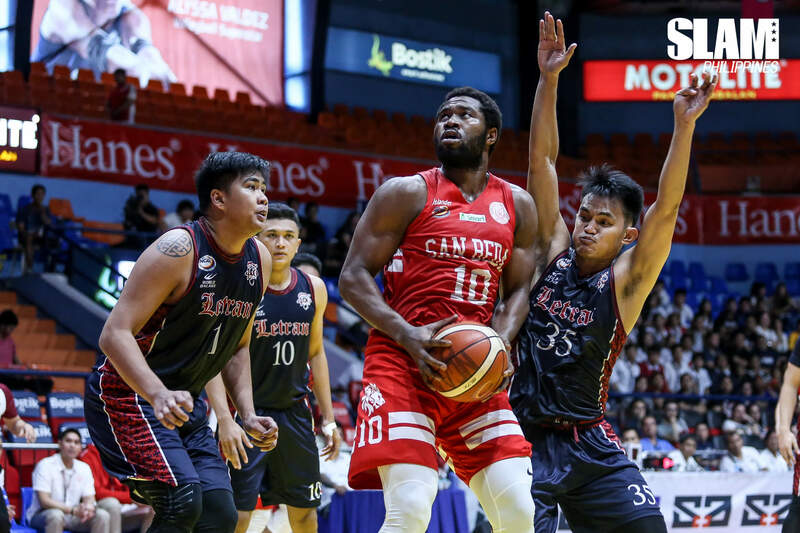 The San Beda Red Lions nearly squandered a 22-point lead but their effort in the end allowed them to escape with a win over the Letran Knights. The Red Lions scored 25 points in the third quarter to build their cushion before the Knights went on a searing run in the final period. Just like in their first game, the Knights and Red Lions were engaged in a tight battle in the first half. Javee Mocon and Donald Tankoua carried the Red Lions in the first half. They were countered by Larry Muyang and JP Calvo’s inside-out attack. San Beda held on to a three-point lead heading into the break. The Red Lions began to pull away in the third period. Their defense shackled the Knights to just 10 points in the third quarter. Robert Bolick hit insane shots to spark the Red Lion run. San Beda jumped out to a 67-45 lead before settling for an 18-point spread heading to the final period. In the fourth quarter, Bong Quinto led the Knights’ run. Quinto powered his way inside for 13 of his 19 points in the final period. Behind their star, Letran went on a 23-2 run throughout the quarter. They got on to within one point with 16 seconds left in the game. Franz Abuda was sent to the line. He made the first to extend the lead but missed the second. The Knights couldn’t secure the rebound as Tankoua saved the possession, leading to free throws that iced the game. 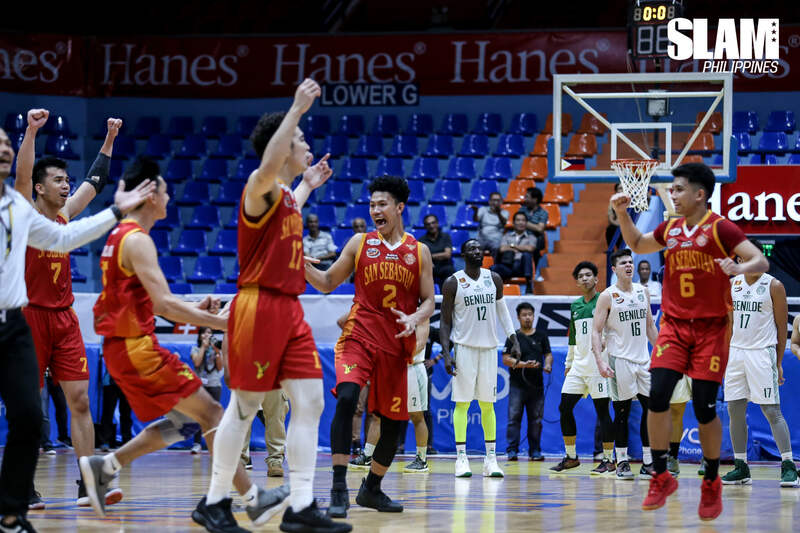 Michael Calisaan’s free throw in the dying seconds was the deciding factor in a close game between the San Sebastian Golden Stags and the Benilde Blazers. However, the game was put under protest by Benilde as they believe Justin Gutang was able to get off a layup before the final buzzer. After a close first half, a balanced offensive effort by the Stags in the third period allowed them to pull away from the Blazers. They teamed up to score 17 points while limiting Benilde to just eight points. They extended their lead to 11 points heading into the final quarter. Just when it seemed like the game was out of reach, Justin Gutang pulled his team back into the game. Gutang scored 16 of his 25 points in the fourth quarter to lead the Blazers. With less than a minute left in the game, the Stags led by five points. Gutang drilled a trey from the top of the key to cut the lead down to just two. After a few defensive stops after, the Blazers were able to tie the game at 65. With only nine seconds left in the game the Stags ran a play to get Calisaan the ball inside. His shot was short but he got the rebound and was fouled on the put back. Calisaan made the first to break the tie. But he missed the second. Haruna got the rebound with less than five seconds on the clock and found Gutang racing down the floor. Gutang drove to the hoop and scored a layup that banked in as the buzzer sounded. Unfortunately for Benilde, the referees deemed that Gutang’s shot left his finger tips too late giving San Sebastian the win. The result is still under protest and will be reviewed by league officials.